[Update: September 15, 2014] Philippine passport holders can now apply for an Australian tourist visa online through the IMMI website. Application fee must be paid via credit card. You can still apply in person through VFS. I am not a visa officer, nor am I migration agent. I am in no way affiliated with the Australian Embassy Manila nor with the Australian government. This post comes from my experience with preparing and submitting visa applications for family members and for myself. Also note that this entry pertains to my experience in applying for an Australian tourist visa in April 2013. This is geared towards applicants who holds a Philippine passport, though the preparation can be applied for other nationalities as well. The Australian immigration update their forms every 3 months. I will try to answer your questions the best way that I can, but bear in mind that I can’t answer all your questions. If you ask a question I’ve already answered in the post, I will ignore you. 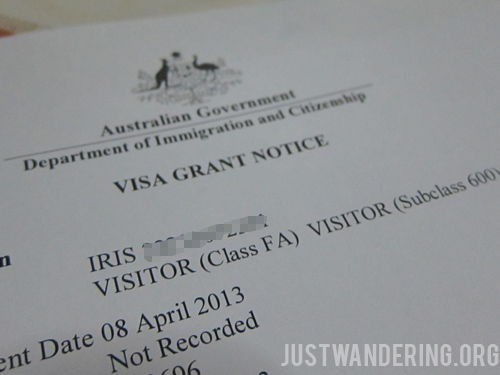 After almost seven years, I finally have an update to my now epic How to Apply for an Australian Tourist Visa series. I have written two posts on the topic, both garnering over a thousand comments, with one getting over 4,500! I have stopped replying to comments, since I don’t think I’m not the best person to be talking about it, as my knowledge of the visa process is largely obsolete, so the visitors have taken upon themselves to answer each other’s questions, with successful applicants coming back to share their good news and help others. It has become a mini forum of sorts and I have to admit I’m happy it turned out that way. I found it to be a great help when I took another chance to apply for an Australian tourist visa once more. I am not a visa officer, nor am I migration agent. I am in no way affiliated with the Australian Embassy Manila nor with the Australian government. This post comes from my experience with preparing and submitting visa applications for family members and for myself. One of the questions people ask me when I tell them I've been to Australia is if it's easy to get a tourist visa. Almost everybody in Manila have heard of stories of how hard it is to obtain a US tourist visa: compiling documents like birth certificate, bank statements, even land titles O_O, paying a high application fee, waiting in line for hours for an interview. Is it as hard to get a tourist visa for Australia as it is for the US? Actually, it's not whether it's harder on not, but it really boils down to how complete your documents are. I believe all embassies would be very meticulous about all the applications they receive, and it is really important to send them all the required documents.